Auflösung is the perfectly bleak ending to Archer: Dreamland. 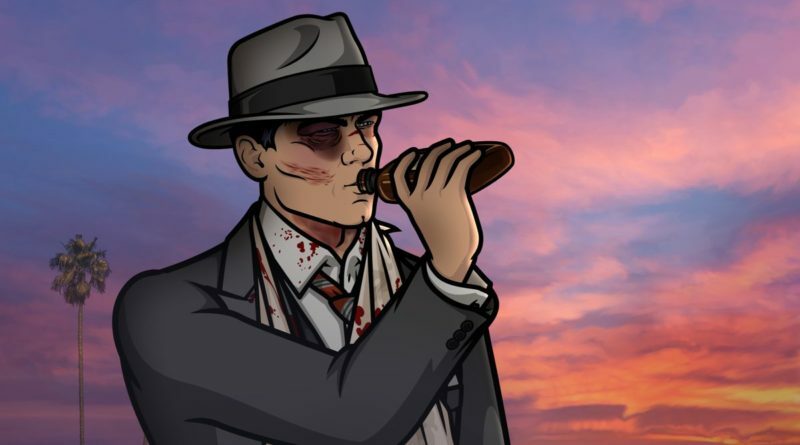 A noir tale needs a bittersweet ending, and Archer delivers. A few minor critiques aside, this is a fitting end to the series. It hits the right notes at the right times, and although a bit light on laughs, this is standard for such a dark dramedy. As the final episode of Archer Dreamland opens, Archer is stunned after having just heard the news: Mother killed Woodhouse. Mother, the woman who hired him, promised to help him find Woodhouse’s murderer, was leading him on a wild goose chase all along for her own ends. However, as with any good noir, the ending is not so simple as that. Auflösung is a perfectly noir ending to Archer‘s darkest, dreariest season yet. The episode opens with Archer staring incredulously. No one speaks, no one dares after the shock Len Trexler gave Archer. The pause lasts a bit too long, heightening the comedy when someone finally dares to speak. Archer is known for using the trick of a bit too long of a pause to build tension for comedic effect, and this episode is one of the greatest examples of it. The bickering in the car was a bit pedantic, but yielded some laughs as Archer resorts to tieing, and gagging his companions. This episode is a little light on laughs. Some of the jokes don’t quite hit as hard as they did in previous episodes, notably No Good Deed and Waxing Gibbous. But lacking in laughs, this episode is not lacking in drama. One of the weakest points of this episode is the survival of Dutch Dylan. The episode needed a villain for Archer to defeat, and it had to be either Mother or Dutch. Mr. Zerk, Mother’s brute, is not an option as with almost no character development this season his defeat would have no meaning. The choice was left by the writers to have either Mother or Dutch be defeated. It would have been a fitting end had Mother been the true murderer of Woodhouse, but of course things are not as simple as they would appear in Dreamland. Mother didn’t kill Woodhouse. At least she says she didn’t. And, as she protests, why would she kill Woodhouse? Because he owed her money? Then how would he pay her back? Archer doesn’t have time to mull this logic bomb over because Dutch arrives in spectacular fashion, redeeming the ridiculousness of his survival. Dutch’s reveal as the murderer of Woodhouse should be too much of a coincidence, but it’s not. One of the brilliant things about Archer is its ability to make cliché and instances of normally bad writing work, particularly because it doesn’t take itself too seriously. Speaking of coincidences, the fact that Dutch even showed up at Mother’s lounge at all is a brilliant coincidence, set up episodes ago. Dutch needs the “blue stuff” to survive, so he must go back to get it from Krieger, who lives in Mother’s basement. Unlike the true identity of Woodhouse’s killer, this coincidence is a happy one, set up properly and paid off with comedic accuracy. Having Dutch be Woodhouse’s killer would normally be lazy writing. The need for a villain to defeat is fulfilled by having a previously established villain magically survive so that our hero can kill him. And if Archer had killed him it would have been bad writing. But Barry is unstoppable even in this reality. Although Archer can’t defeat him, Krieger can. Although one must ask, what was Krieger thinking in turning Dutch into an unstoppable cyborg? He was a murderer before, what makes Krieger think he would be better now? Krieger fixes his mistake, however, by having his robot dogs take care of his miscreant creation. Everything is wrapped up in a neat little bow. Zerk wordlessly confesses his love to Charlotte, who rejects him. Again, a good payoff, because the typical ending in a bad screenplay would be to have Charlotte accept his love. But this isn’t in her character and Archer uses this opportunity to be true to it’s writing and tell a joke. Then we come to the tragedy of the episode. Lana is outed as a T-Man (no, not a transvestite, although she probably wishes that’s what it meant). Mother, understandably nonplussed, points Archer’s gun at Lana, which has a hair trigger. The gun goes off, and Lana falls down. Then it goes off again. And again. And again. Seven times. No one, in any reality, survives being shot seven times. Except for Archer, that is. The gun gag was stupid. Dumb. Then good, really, really good. This is the genius behind Archer: to make stupid plot points and dumb twists good. Archer isn’t a noir film, even though it emulates one. It’s a satire of them, just like mainline Archer was a satire of spy films, ’80’s Cop Dramas, and the Neo Noir in previous seasons. Archer needs to jump its sharks not only to stay fresh, but also to allow it room to explore and satirise different stories. Even jumping the shark, usually a desperate attempt to keep a show fresh, works in a better way than in the shows Archer satirises. The tragedy, the bleakness of this ending is superb. There is no money, and never was. Lana dies, and Poovey is abandoned by the chinese prostitutes he rescued. 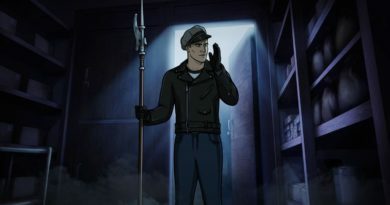 The closing scene, where Archer speaks to Woodhouse’s tombstone, is a fitting end to the series. The beautiful joke of Woodhouse’s undetermined age, explored in the first season and continuing even to this one, is subtle. In a blink and you’ll miss it scene, Woodhouse’s tombstone reads “Woodhouse: ? – 1947”. I literally laughed out loud. Archer bids a farewell to Woodhouse, saying that he’ll see him in a week. Or, whenever. He’ll play it by ear. Is this a message from Adam Reed, telling us he isn’t sure what next season will bring? Perhaps, or perhaps it’s just a throw away line. We’ll have to wait and see. 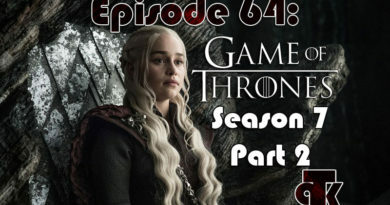 As a series finally goes, what is there to say? Is Auflösung the best episode of the series? No, but it’s close. As bleak as it is, and it is truly bleak, it is fitting to the setting of Dreamland. Perhaps Adam Reed was willing to go so dark and bleak because this is all a dream. Or perhaps Reed is beginning a darker run on Archer. For my final thoughts on Archer Dreamland as a whole, stay tuned for my season summary. ← What Inconsistencies appear in the writings of J.R.R. Tolkien?